Retro-future space age fantasy meets retro-18th century legend in this gentle gem of a film. 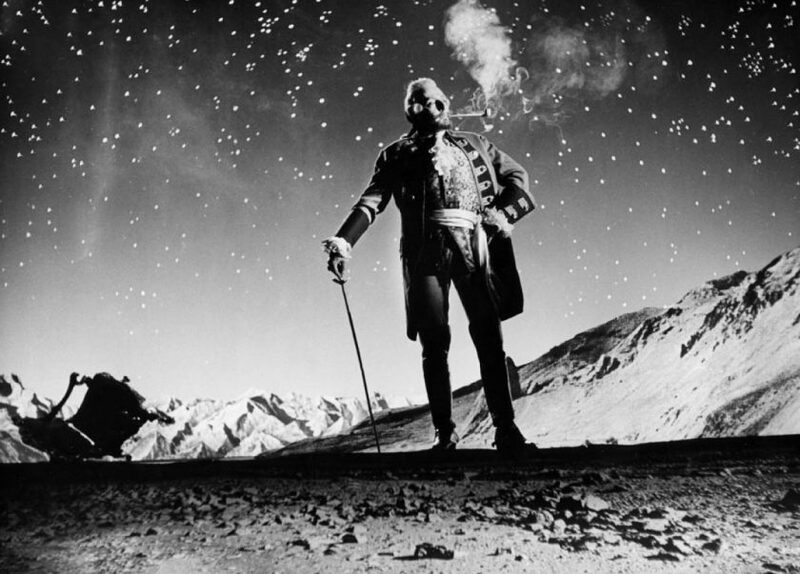 Tony, an astronaut, lands on the moon to find the legendary bullshitter Baron Munchausen (known in Czech as Baron Prasil) quaffing wine in the company of Cyrano de Bergerac. Tony and the Baron travel back to Earth together and embark on a series of adventures with Princess Bianca, whom they rescue from a sultan’s harem. The adventures include a siege, during which the Baron spies enemy positions from atop a flying cannonball; and a sojourn on a ship marooned inside a whale’s belly. Zeman was the Czech Ray Harryhausen, a man who has held generations spellbound with his mixtures of live action and animation, with wonderful black and white lined matte work influenced by the wood engravings of Gustave Dore. The live action figures are seamlessly inserted into these grand outlined environments – the effect might be hard work but here there are some beautiful psychedelic colours as well as a story that involves several iconic picaresque incidents. The Fabulous Baron Munchausen is out on DVD and Blu-ray on 24 March 2017.